Plumbtile remains on top as the leading showroom of contemporary and traditional kitchen and bath designs. What are the characteristics you will see in Plumbtile? They lead the kitchen and bathroom decorative marketplace by functionality, luxury, and quality products. 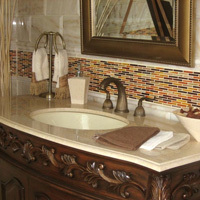 Plumbtile stays on top of the latest decorative trends, while maintaining traditional elegance. So what is latest and “in” for kitchen and bathroom tiles? Read on and we’ll tell you more. What is Agate? Why so special? Agate is a type of silica, a microcrystalline variety and is characterized widely by its bright color. They are found in many types of rock. Agate often forms from nodules in volcanic rocks or ancient lavas. Just imagine how much time it took to form them. Silica is found in many crystalline forms, the most common being quartz, which is the second most common mineral on earth. These special rocks are the most beautiful formations you will ever see. Yes…. and before you jump into any conclusions: Faux Silica, silly. The Silica mosaic glass collection available at Plumbtile looks amazingly like the real deal. They all look like naturally layered agate formed from many years of volcanic stress. The finishes will remind one of matte silk and some iridescent pearl. Call 1-866-369-8180 today to find out more about silica and agate. You can also contact Plumbtile to find out more about their amazing products or latest trends! The toilet is a convenience that people generally take for granted. Roughly 40 percent in the world’s population don’t have adequate sterilization facilities ultimately causing over 1.5 million deaths yearly – generally from children below 5. American Standard Brands, the parent company of JADO/Porcher, took up the task with The Bill & Melinda Gates Foundation to develop the sustainable strategy to the problem associated with inadequate sterilization. Through funds awarded in April 2012, engineers from American Standard will develop and test the low-cost, safe, as well as easy-to-install toilet system that can improve water conditions associated with developing countries. American Standard is committed to making a change in the world, through toilets. American Standard has stood for quality and innovation and is in 3 out of 5 homes throughout America. 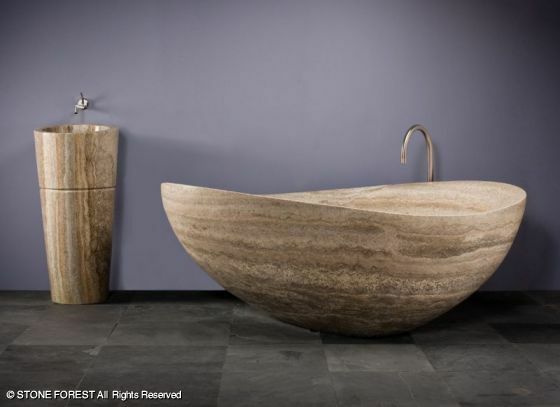 They have a diverse selection of bath tubs, from old fashioned Slipper soaking tubs to modern Air Baths. PlumbTile has a comprehensive collection of American Standard products. If you are unable to find an item you want, you can go to the Product & Price Information Request page. Browse the PlumbTile site to see different toilet brands by various manufacturers. If you are looking for bathtubs, click here to see the current brands available on the site. 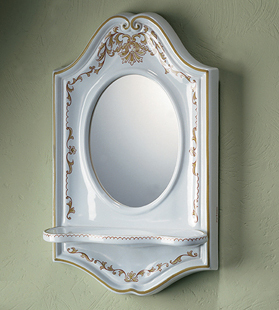 Are you a fan of basin sinks? Then, you MUST check out the Bates and Bates products that Plumbtile offers. 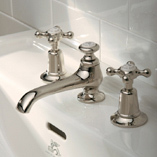 All Bates and Bates products are given the special touch with a hand finish. That means you can rest assured your basin is completely original. There are many different types of tile on the market today. Copper, stainless steel, ceramic, hardwood, and stone to name the most popular. But today we would like to showcase one of our recent favorites: glass tile. 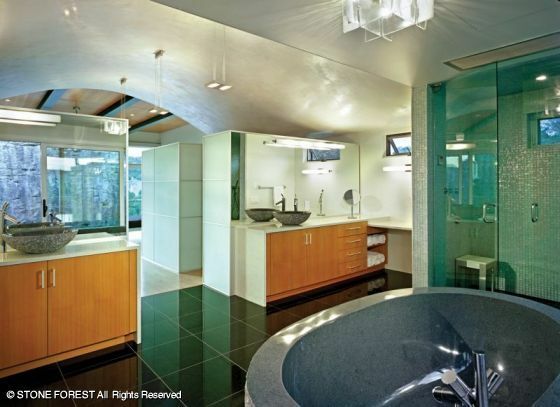 Glass tile has been growing in popularity for the last couple of the decades – and for good reason! Glass tile uses are almost as endless as the imagination. It can be used for kitchen backsplashes, walls, bathtub and shower walls, borders to accent windows or mirrors, and floors. The properties of sparkle, luminescence and depth, not found in other types of tile, create a style and character unmatched by other types of tile. The ambience created with lighting and reflective properties of glass tile is unparalleled. The concept of universal design continues to gain acclaim and prominence among architects, contractors and homeowners. With the growing demand for products that are accessible and functional; these products are becoming more attractive and appreciated. Ron Mace: architect, is credited with creating the concept on an international level. The formal definition of universal design stated by Mace is “the use of products, spaces and anesthetics to the greatest extent possible, regardless of status, ability or age. The universal design concept changes the design paradigm of expecting people to adapt and function according to design. The new human-centered design employs products and design to support lifestyle and circumstances as we currently live. Additionally it must adhere to differences in human factors while utilizing appealing aesthetics. Universal design concept targets the entire population, considering that changes occur over the life of the home and its occupants. Conversely, aging-in-place refers to environmental modifications that support the aging process as it advances. The baby boomers finding: aging-in-place more desirable and the drive to reduce environmental impacts have both contributed to the growth of universal design. When a home’s design utilizes Universal design it reduces or eliminates the need of modifications later in life. This makes universal design products not only a smart choice for seniors but for children as well. Home appliance and plumbing manufacturers continue to produce more products to enhance safer, simpler and more comfort while retaining beauty. One of most critical spaces in the home for safety is the bathroom. There are countless products from shower to lighting to keep the bathroom safer for all occupants. European style with a seamless and beautiful shower. Flush with the floor and often feature a trench drain to contain water in the shower area. Easy access for foot and wheelchair traffic. A slip-resistant, textured floor to help prevent shower accidents . Next to the toilet provide safety and support for anyone. Easier navigation without assistance at night. Increased room color contrasts to offset decreased visibility. Ledge or seating on tub edge adds improves ease in maneuvering in and out of the tub. In keeping the universal design concepts in mind, manufacturers are producing more design options and flexibility to coordinate the aesthetics with faucet and share textures and as decorative or functional components. Kitchen lighting, accessories and appliances have seen incredible design improvements to make them more intuitive, easier and safer to use. Dishwashers and refrigerators can now be built into drawer spaces for easier access. In addition, induction countertops are more energy efficient and offers improved safety compared to conventional stoves. Induction stove surface remains neutral during cooking and the cooktop is shallow so it may create space for wheelchair users. Empty space under countertops around sinks or cooking areas is great seated access and flexibility. Lower countertops and sinks give easier access to children and wheelchair users. Roll-out shelves or drawers make it easier to see and reach items stored in lower cabinets. Pull-out counter underneath a built-in single wall oven makes transfer of hot dishes or pans from the oven easier. Hands-free or touch-activated faucets promotes easier to use for children individuals with arthritis or compromised strength. To conserve water, many have a automatic shut-off. With universal design; beauty, safety, convenience and independence can all be improved for all household members. Enter to Win a $1,000 Shopping Spree at Plumbtile! With the new year, Plumbtile has brought a new Facebook promotion. While you can no longer sign up to get a free Starbucks card, you can sign up for an extra 10% off your next purchase and automatically be entered to win $1,000 towards select Plumbtile products. In order to receive your discount and be entered into the drawing, you will need to follow BOTH steps outlined here. Like the Plumbtile page and then enter your name and email address in the fields provided. You will receive details for your 10% discount within a few days, and will be entered into the drawing. 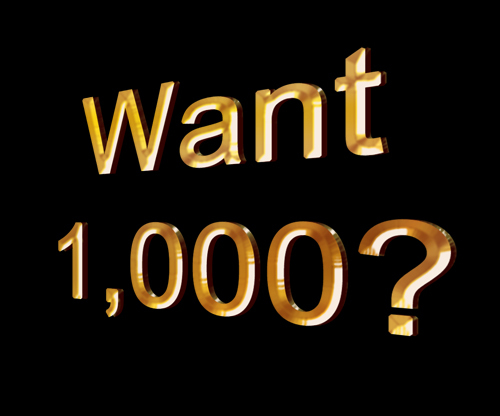 The winner of the $1,000 drawing will be announced on Facebook and notified by email. Get yourself entered before time runs out and good luck! While you await the results, why not peruse the Plumbtile website for tile, furniture, and accessories that you’d like to spend the money on? Autodesk Homestlyer is a free application that allows users to create and share home designs in 2D and 3D. You can build and design the room of your dreams with a few simple clicks. Or if you prefer, you can redesign your own current living space. See how the couch you’ve been eying would fit in with your curtains. Or see how that bathtub and sink you want to redesign your bathroom with will fit into the space you have. Do it all here and so much more. This is an excellent tool at the best price possible: free. The system offers deep customization with color, texture and actual objects. The images are reminiscent of the Sims, with a slightly more realistic edge. Users can view a birds eye perspective for layout purposes or lower themselves closer to the floor for an in-the-room perspective. The available products and decorations are real items that can be purchased. After completion, users can even take a high resolution screenshot of their future project. This innovative tool is all about visualization. Floor plans include color and texture so the user can get a good perspective on how each combination of items, flooring, walls and more will look. The system is very easy to use, with a drag and drop interface that dramatically decreases the amount of effort it takes to learn how to use it. You can choose to start from scratch and create your own floor plan to mirror your current one or the one of your dreams or you can choose a floor plan from the extensive design gallery to toy around with. Add, delete and move around flooring, fixtures and even furniture to create your dream room. The Design Gallery allows you to see real life photos of the room plan that you will be looking at and toying with. You can create, move and design everything from the floor, walls, furniture lay-out and even the landscape outside the room. This application is truly amazing in how in-depth it is. From Duravit to Kohler, many of your favorite brands and manufacturers are featured in this application. Instead of going to your local hardware store and wonder how that counter top will look in your kitchen, you can use this application to lay out your kitchens current floor plan and add your favorite counter tops. Why stop there, see how that neat looking sink will look with your new counter tops, even decorate the walls. You can totally transform your entire kitchen, living room, bathroom, bedroom; the options are endless. 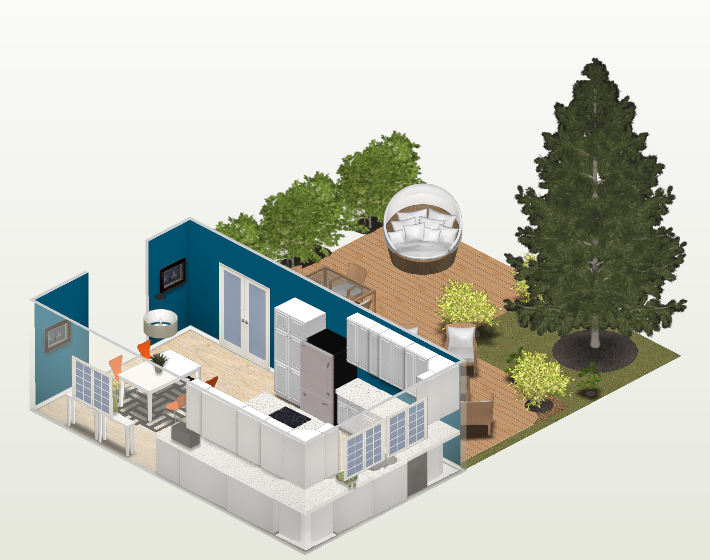 Anyone who is going to be doing some home remodeling in the future can really appreciate Autodesk Homestyler. The system is very easy to use so a realistic visualization can be constructed quickly. The user can even view from different perspectives and try adding real life products.